Event attendance tracking software is designed to manage the attendance on different sessions, and it is highly recommended for event organizers like Ellen. Midway through her last conference, the event organizer Ellen was checking multiple sessions. One session was packed with people and some were even sitting on the floor. But, the next big auditorium was full of empty seats, embarrassing the panel speakers! If Ellen could have known which session would be most popular, she could have switched the room. She moved along to the next room, where a special training session was going on. She needed to send them a certificate later, but realized that there was no way of checking if everyone there had signed up properly. Check in attendees on a session-by-session basis. Let’s explore how it can improve your next event in various cases. With this new feature, you can set an enrollment capacity for each session. This can be extremely helpful if you have space constraints in your venue, or intend to have sessions that include group discussions or training. Attendees can easily enroll in a session and add it to their event agenda. If they change their mind, withdrawing is just as simple. And if they find a session they’re interested in, but is already at capacity, they can join the waitlist. As an organizer, you can see all the names of those who have enrolled, and those on the waitlist through the web dashboard. You can also enroll attendees by yourself if you have the list of people signed up for the session. If you’re just interested in collecting the number of attendees who plan to attend a certain session, you can also utilize the session attendance management feature without setting a capacity. Just give attendees the option to enroll, and you can have an accurate headcount for easy planning. You’ll know you have the right sized room, enough chairs, and enough printed materials or pens for every attendee and speaker. Often times, it can be helpful to have a record of who attended which session. Perhaps it is to distribute a certificate to attendees who complete a course during their session. Or, you want to send them a specific follow-up exercise or survey after the event. Another possibility could be If session attendance is a requirement for employment or management. For all of these factors, having trackable, digital data of who attended the session and how to get in contact with them can be extremely helpful. From the Whova dashboard, you can export all the names of those who have enrolled and checked-in. Then, you can send this list to whoever needs it. 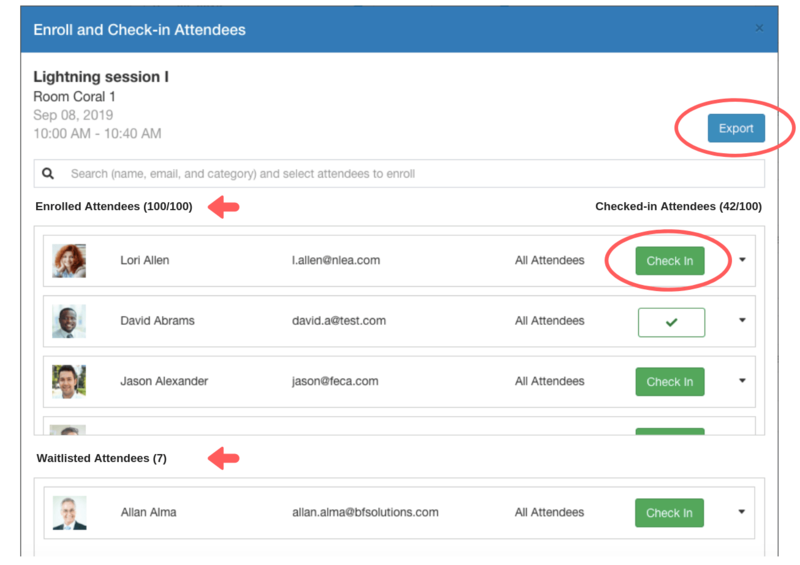 To ensure every attendee ends up at the correct session, you can take advantage of individual check-ins. As attendees stream into the room, organizers can check them in either through the app or the web dashboard. 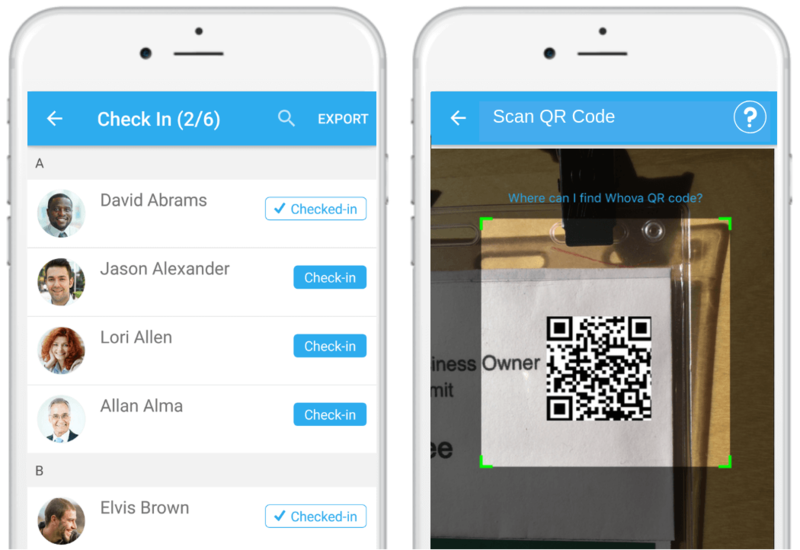 If you use the Whova’s complimentary name badge generator and have individual’s QR code on their badges, it will be easy and fast for you to scan the codes through the app. Every member of your organizing team can have access to the enrolled list of attendees at every session and check attendees in concurrently with multiple apps. By taking advantage of this new Session Attendance Management and Event Attendance Tracking feature, you can ensure everyone has a stress-free event day. Your event will look professional and well-organized. That’s not it. From a multi-track support to a sleek web agenda builder, you can get all you need while saving your precious time. Request a 20 minutes live demo now. From 30% to 90%: How Did You Increase Your Event App Adoption?